In 1898, nine years before the ocean liner Titanic was planned, the American author, Morgan Robertson, published a book named Futility. In this novel he wrote about the largest craft afloat, acclaimed to be practically unsinkable. This triple screw steamer sailed in April the north-Atlantic route where it hit an iceberg and sank with a slight list to starboard. It did not have enough lifeboats for its passengers. Most astonishing is the name Robertson gave his vessel: Titan. The book further describes that while enroute and at full speed, the Titan cut through a smaller ship. The Titanic had a near collision with an American liner named the New York. New York also was the destination which the Titanic never reached. Many other details that Robertson described matched the reality which happened fourteen years later. Morgan Robertson stands at the left side of the grand staircase. The Italian inventor, Guglielmo Marconi poses in the background with his wireless receiver. 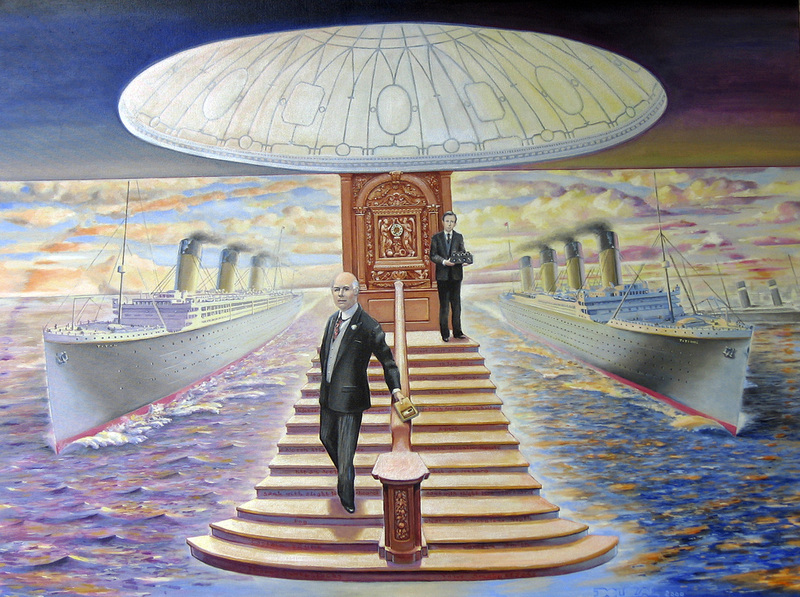 He is the hero of this painting because although his invention was ignored in the form of seven iceberg warnings which the Titanic received, it was also responsible for the rescue of 705 survivors. Warnings can serve as guideposts along our paths if we recognize and heed them. At a higher level of consciousness, often triggered by a creative use of the mind, some individuals can access other dimensions of reality and pre-live events before they physically manifest. Every individual, however, has created his present state by his thoughts and actions of the past.